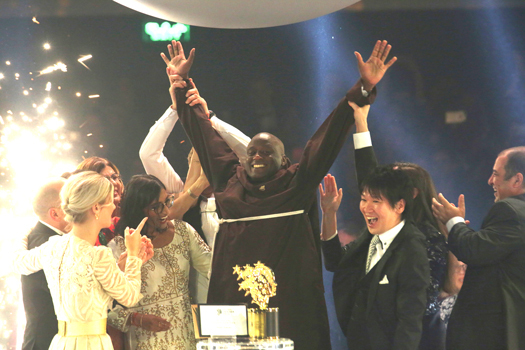 DUBAI (IPS)—A math and physical science teacher from an impoverished school in Kenya’s Rift Valley, Peter Tabichi, has won the $1 million Global Teacher Prize, becoming the first teacher from Africa to clinch the prize established to honor the profession. Mr. Tabichi, 36, emerged the winner from a top list of 10 nominees from Brazil, Georgia, Netherlands, United Kingdom, India, United States, Argentina, Australia and Japan. The Global Teacher Prize is the largest prize of its kind that recognizes an exceptional teacher who has made an outstanding contribution to the profession but also to highlight the important role of teachers in society. Actor Hugh Jackman announced Mr. Tabichi’s name at a glittering ceremony that sent the packed hall into thunderous applause. Mr. Tabichi was recognized for his dedication, hard work and passionate belief in his students’ talent. Thanks to his efforts the poorly resourced Keriko Mixed Day Secondary School in Nakuru County, in remote rural Kenya, has emerged victorious after taking on the country’s best schools in national science competitions. Citing his father as his inspiration for becoming a teacher, Mr. Tabichi, a member of the Franciscan Brotherhood, gives away 80 percent of his monthly income to help the poor students in his school, many of whom come from poor families—almost a third are orphans or have only one parent—with many going without food at home. The students have difficult experiences ranging from drug abuse, teenage pregnancies, early school dropout, young marriages and there have been cases of suicide. The school itself has only one computer, a poor internet connection, and a student-teacher ratio of 58:1. Kenya’s President Uhuru Kenyatta, congratulated Mr. Tabichi on winning the award in a special video message broadcast at the ceremony in which he described Mr. Tabichi as a shining example of what the human spirit can achieve, not just for Kenya and Africa, but also for the rest of the world. The Global Teacher Prize, open to all working teachers, is part of the Varkey Foundation’s commitment to improving the status of teachers across the world. In their Global Teacher Status Index in November 2013—the first attempt to compare attitudes towards teachers in 21 countries—the study found that between a third and half of the parents surveyed would ‘probably’ or ‘definitely not’ encourage their children to enter the teaching profession. The Global Teacher Status index in 2018 showed for the first time a direct link between teacher status and pupil performance as measured by PISA scores. “I want to congratulate Peter Tabichi for winning the Global Teacher Prize 2019. I hope Peter’s story will encourage others to enter the teaching profession and shine a spotlight on the truly inspiring work teachers do to make tomorrow brighter than today,” said Sunny Varkey, founder of the Varkey Foundation. In an earlier interview with IPS Mr. Tabichi said if he won he would use the prize money to strengthen the Talent Nurturing Club, the Science Club and inter-school science project competitions at the school. He also planned to “invest in a school computer lab with better internet connectivity.” And said that he would also promote kitchen gardening and production of drought tolerant crops in the community at large.